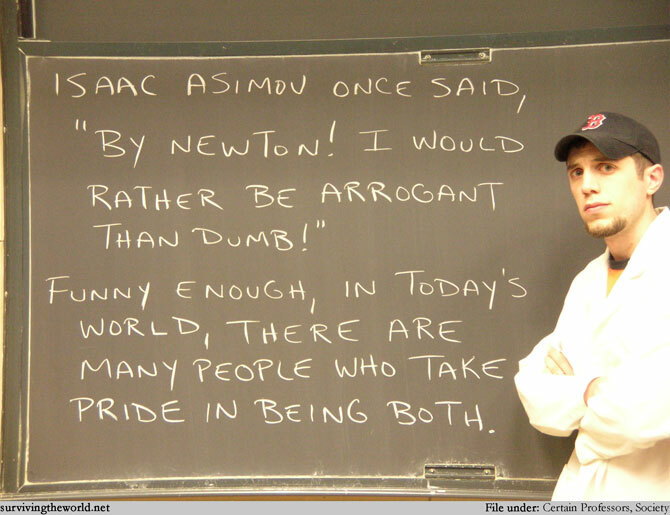 Asimov's quote was in reference to teaching and instructing people in terms of science, focusing on the idea that you shouldn't dumb down the information. And that's the wrong attitude. I think if you come across as arrogant and just expect people to jump up to your scientific level, they never will, and they'll be much less inclined to give you a fair chance to pass along your knowledge. So you do need to start at their level. BUT I also think you can reasonably expect people to be able to make intellectual leaps as you teach them - in terms of teaching a class, you challenge them at one level in the classroom, at another level on homework or assignments, and then on another level on the exams. It's difficult, but people learn a lot more. You can take the same approach to informing people about science outside the classroom, but if you don't start at their level, they aren't going to be willing to make those intellectual leaps. Of course, then you can get into the people who are happily ignorant and love to remain at that level, no matter what knowledge you try to share. And they're just as bad.